Welcome to our live blog from the College Station City Council’s workshop and regular meetings on Thursday, June 14. It’s not the official minutes. The workshop has started. No action was taken out of executive session. Councilman James Benham is participating via teleconference. A&M Consolidated School Zone: The extension school zone time to 4:15 p.m. around A&M Consolidated High School on Nueces Drive, Welsh Avenue and FM 2818. Stop Signs: The addition of stop signs at various intersections. Wire & Cable: A $712,700 bid award to Techline for the purchase of wire and cable to be maintained in inventory. Tree Trimming Services: A $1.5 million, three-year contract with All Around Tree Service for electric right-of-way tree trimming services. Solid Waste Collection Fees: The first increase in fees for residential solid waste collection services since 2006. The last commercial rate increase was in 2014. Click here to see the proposed rates. Economic Development Incentives: The resolution would re-adopt the city’s guidelines regarding property tax abatement as required by state law. The council directed staff to bring back an ordinance creating a five percent Homestead Property Tax Exemption. Homestead exemptions remove part of a home’s value from taxation, such as the first $25,000 or $50,000 of assessed value. The ordinance will be considered at the June 28 council meeting. To offset the estimated revenue loss of $664,000, the council will consider a 3/4-cent tax increase as part of the FY19 budget process later this summer. The consensus of the council was to extend the city’s Extraterritorial Jurisdiction (ETJ) from 3 1/2 miles to five miles. The ordinance will come back for a vote at a future meeting. Council also opted to offer new 10-year annexation agreements to several property owners in the ETJ. Robert Rose gave a short presentation on the Austin Veloway and suggested College Station pursue a similar amenity for its citizens. Stacy Watt also spoke in support of a local veloway. 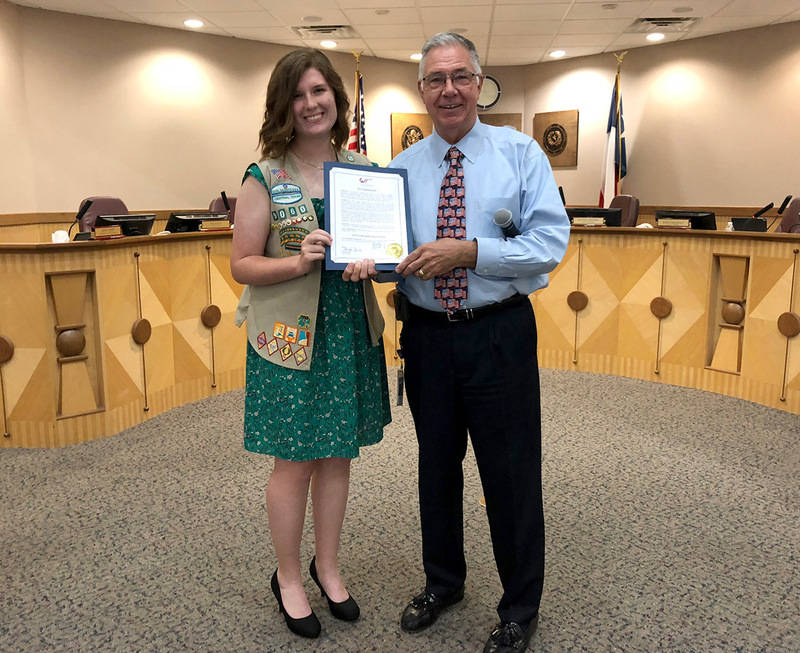 Mayor Mooney proclaimed Girl Scout Gold Award Day in College Station and recognized local girl scout Ashley Poprik for creating a winning documentary entitled Camp for All. Ashley recently graduated from A&M Consolidated High School and plans to attend the University of Texas at Austin. The extension school zone times to 4:15 p.m. around A&M Consolidated High School on Nueces Drive, Welsh Avenue and FM 2818. The addition of stop signs at various intersections. A $712,700 annual bid award to Techline for the purchase of wire and cable to be maintained in electrical inventory. A three-year, $1.5 million contract with All Around Tree Service for electric right-of-way tree trimming services. A $364,759.40 contract with Palomares Construction for sidewalk improvements along Southwest Parkway between Wellborn Road and Welsh Avenue. An inter-local agreement with the City of Cedar Hill for cooperative purchasing. A $409,825.90 contract with Binkley & Barfield for engineering services related to the design of the Greens Prairie Trail Widening Project. The first increase in fees for residential solid waste collection services since 2006. The last commercial rate increase was in 2014. Established fees, rates and charges for commercial and residential burn permits. A $93,272.19 change order to a contract with Acklam Construction and a time extension of 45 days for changes at the Larry J. Ringer Library. A $1.34 million contract with Forbes Bros.Timberline Construction to replace 12 transmission poles and hardware and 5.62 miles of steel shield wire on the transmission line with optical ground wire fiber optic conductor. A $425,203 contract for the purchase of right-of-way for the Capstone/Barron Road Realignment Project. A resolution to re-adopt the city’s guidelines and criteria governing property tax abatement. Ratification of the city manager’s authority to designate Experience Bryan-College Station as the local organizing committee to coordinate the funding application for the 2018 American Quarter Horse Association Youth World Cup and approval of the event support contract. After a public hearing, the council unanimously approved a request to change the zoning from Rural to Planned Development District for about seven acres along the south side of Lakeway Drive near the Medical Avenue intersection. The change will allow a senior housing development. After a public hearing, the council unanimously approved an amendment to the city’s Unified Development Ordinance regarding landscaping requirements and buffer standards. Encouraging drought tolerant irrigation by increasing the point credit from 10 percent to 20 percent for water-conserving irrigation systems. Providing an extra 50 percent increase in landscaping points for Texas native plants. Incentivizing the retention of older or larger trees by doubling the point values for each protected tree. Creating administrative flexibility to waive buffer requirements adjacent to residential common area and exempting buffers adjacent to FEMA 100-year floodplain. Removing the double landscape point requirements for building plots over 10 acres. Removing the heightened 2.5-inch caliper tree requirement for building plots over 15 acres and allowing these sites to meet the 2-inch caliper tree requirement of other sites. Providing water conserving landscaping options such as xeriscaping in lieu of sod. Requiring buffer by developed or proposed use instead of by zoning district. After a public hearing, the council unanimously approved a request to change the zoning from Rural and General Commercial to Planned Development District for about 31 acres southwest of the Arrington Road-Greens Prairie Road intersection. 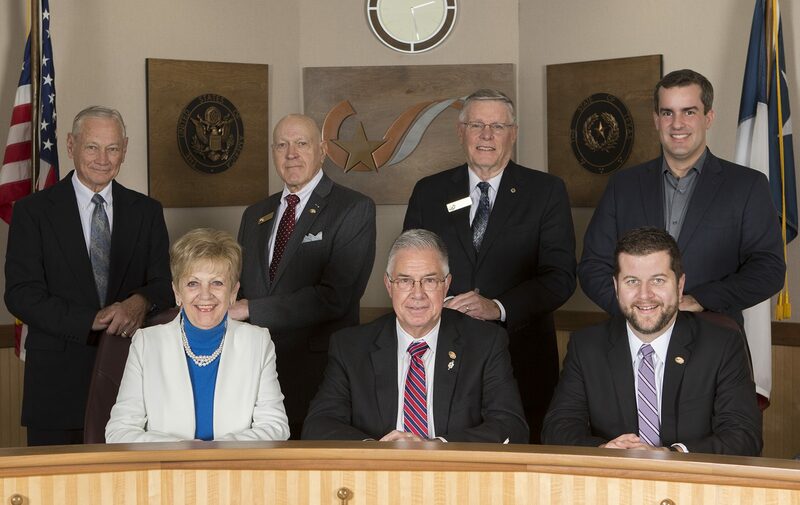 The council unanimously approved an interlocal agreement with Brazos County for improvements to Rock Prairie Road from Holleman Drive to Wellborn Road. The proposed cross-section of the roadway is two travel lanes, a continuous two-way left turn lane, bike lanes, and sidewalks. The council unanimously appointed Karen Bonarrigo to fill the last two years of Paul Bonarrigo’s term on the Experience Bryan-College Station board. Mr. Bonarrigo is stepping down due to competing responsibilities. After the council discussed and reviewed future agenda items, Mayor Mooney adjourned the meeting. The council meets again on Thursday, June 28.